Thread by @ZaidJilani: "But the Center for American Progress and its leadership have opposed Bernie Sanders's politics since he announced in 2015. The wounds are we […]"
But the Center for American Progress and its leadership have opposed Bernie Sanders's politics since he announced in 2015. The wounds are well and open. Sanders' team just isn't refusing to respond to attacks this time. This time, they're a real campaign. ThinkProgress has many independent minded writers but it is not editorially independent. The larger issue is that corporations and foreign governments get access to CAPs policy making process, and CAP has high govt access. Stories I wrote for The Intercept demonstrated how the UAE used CAP staff to lobby the Trump admin, as it was funding CAP. The head of CAP, Neera Tanden once scolded me for writing a blog post noting that Michael Bloomberg partner was drawing a salary for Zuchotti park. She noted that CAP was soliciting Bloomberg as a donor. I'm far past personalizing differences with this institution,its not about me its about what kind of country we want to live in, one where debates are open and honest or one where elites have disproportionate influence over the world we live in via private institutions. It was a regular occurrence when I worked at CAP for corporate donors or party elites to complain to our leadership and get us chewed out for what we were writing. How can a think tank "think" when it isn't free of influence from corporations, foreign govts, and party elites? A *lot* of people know this is how CAP operates. But because it's a clearinghouse for Democratic presidential administrations (and access to government more generally) most people are unwilling to publicy about it. Washington's access culture is suffocating them. To be truly independent, a think tank and the nation's intellectuals have to be able to speak freely without interference from corporate donors, foreign governments, or party elites. They are supposed to be independent institutions, not political operations. One time I was on a call with Sherrod Brown about opposing Free Trade Agreements, and a CAP senior staffer informed me that CAP supports the FTAs and so I just didn't write anything about it. The Walton Family is regularly cited by Bernie Sanders for its concentrated wealth, while it has maintained a business empire based on low wages and monopolization of local economies. Can Bernie Sanders staff his White House with a think tank who solicits money/advice from them? 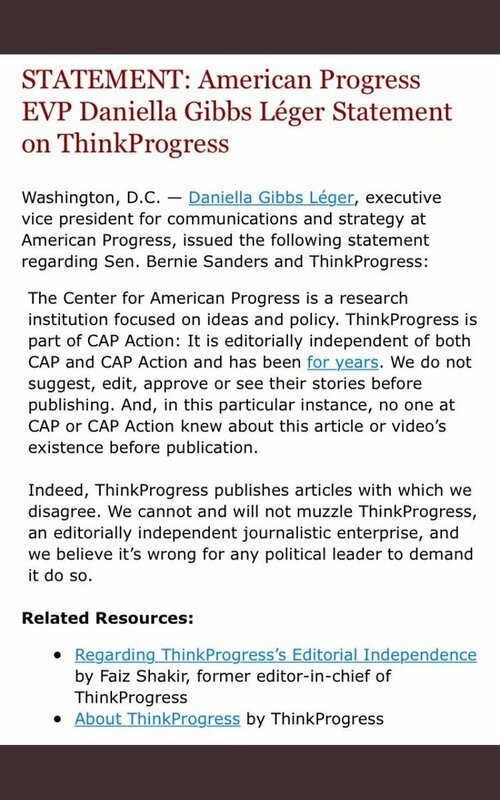 Current ThinkProgress staff say they have editorial independence. If that were true it would be beneficial for them to report on how corporations and foreign governments influence their employer, considering they'd just have to walk down the hall and ask. They're better sourced. Working at CAP is considered by many to be a sort of shadow white house, and that's why I think they don't consider this model of operations to be odd or unethical -- this is how decision-making in the US government operates, too. Sanders would do well to change this. It's not about me or CAP alumni speaking up. Long after I'm dead and gone we still deserve a country and political system that is transparent and democratic, not guided by the whims of only a few due to their political access and money. My first month working there the development team was upset one of our articles criticized a CAP corporate donor. We had a meeting about how to push back (they wanted heads up on articles we wrote hitting donors). Matt was in the meeting and upset. Matt, stand by your values. Interesting natural experiment over past three days. CAP argues money has no influence over it. CAP initially defends video attacking Bernie Sanders. After billionaire board member objects to it, CAP apologizes for the video. Does money not have influence over CAP? Bernie Sanders's issue is his voter base is very young and left, and in order to win he needs a voter base that is also older and less left. In 2017, the British Labour Party approached this challenge by producing ads like this. Ads like this were clever because the Labour Party under Corbyn understood its challenge and addressed it head on, they didn't just message to their base, but the parents and grandparents of their base. Bernie Sanders needs to fire his comms team now. They are not good at the things. This is a stunning attack by the Sanders team on an independent org for which two of his top people worked. Unlikely Sanders wrote this letter himself; it has none of his standard hyperbole. His senior aide, a former CAP employee, has attacked @neeratanden repeatedly, though. Making this letter more disturbing is the fact that @BernieSanders campaign manager @fshakir is former editor-in-chief of @thinkprogress who in fact wrote all the policy for this very issue. This bespeaks lack of cohesion in the Sanders campaign and suggests personal animus. That @BernieSanders would personally attack @neeratanden, a woman of color, when Sanders has long been chastised for both misogyny and failing to properly acknowledge communities of color, is at best counterintuitive and at worst borderline racist and misogynist.